On Mar. 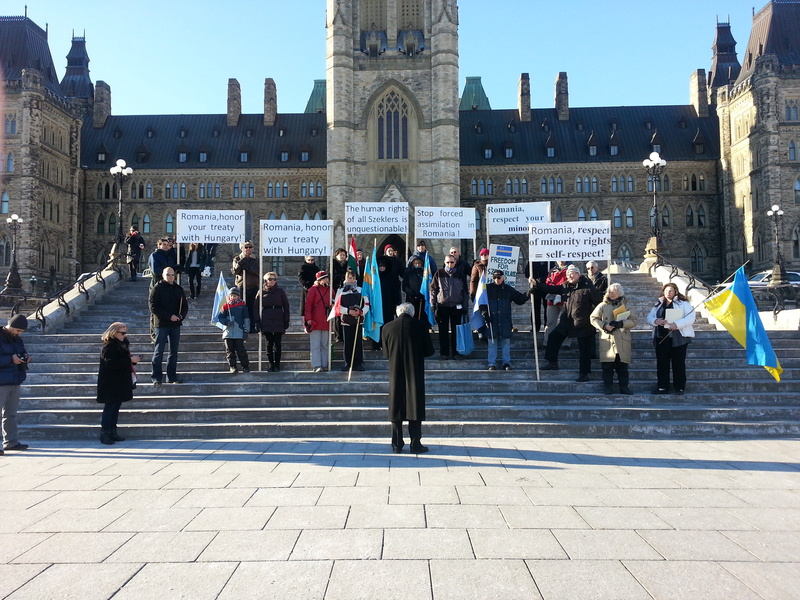 8, 2014, a modest number of protesters stood on the steps of Ottawa’s Parliament buildings in support of the Szekler Hungarian minority in Transylvania, who are fighting to maintain their identity in Romania. The Szeklers are protesting a proposed Romanian legislation that would combine Romania’s 42 counties into eight regions, according to the Global Post. The protesters were showing moral support for the Szeklers in Romania who held a mass demonstration in Transylvania Mar. 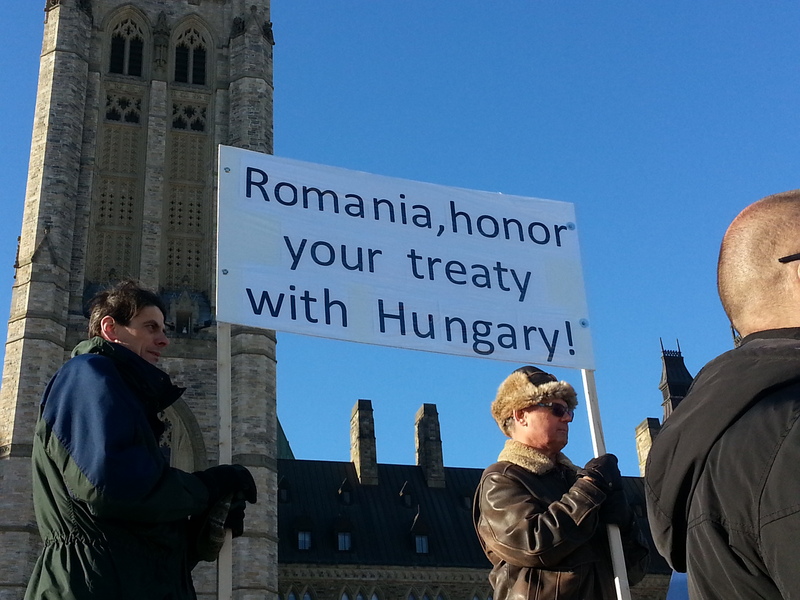 10, said Daniel Feszty, president of the National Alliance of Hungarians in Canada. Last October, thousands of Szeklers marched in Romania to protest the proposed legislation. In what was known as the Great March of the Szeklers, around 120, 000 people formed a 53-kilometre human chain, according to Politics.hu. Protests of support took place in 30 cities, in 13 countries across the world. According to Romania’s Business Review, Romanian Prime Minister Victor Ponta said the reorganization of Romania’s 42 counties is intended to strengthen the country’s regions and reduce their dependency on governmental funding. Ponta told the Business Review that, “designing regions with improved structures around the current regional development agencies (ARD) would be more efficient in absorbing the EU funds than central government.” Romania has one of the lowest absorption rates of European Union (EU) funds, the Business Review reported. According to the European Union’s website, the EU provides grants and funding for a broad range of programmes and projects for education, health and environmental protection. The Szeklers’ claims for self-governance are intended to maintain their cultural identity in Romania by reserving the right to do such things as teach their own language in schools. Szeklers make up six per cent of the total population of Romania and 20 per cent of the population of Transylvania. There has been tension between Szekler Hungarians and Romanians in the past. In 1990, an anti-Hungarian called the Romanian Cradle promoted xenophobic messages through the local press and on national television. According to Feszty, Szeklers in Transylvania still face discrimination if they speak their own language. “None of the Canadians tell us how to speak on the street, in the community centre, and really we just wish that the life back in Romania would be equal like this. It’s our duty and obligation to show solidarity with our compatriots who are less fortune than us,” he said. “We hope we can get the attention of mainstream Canadians, real Canadians, who might not be Hungarian, who might have never been to Transylvania, but who purely think this is the right thing to do,” Feszty said.